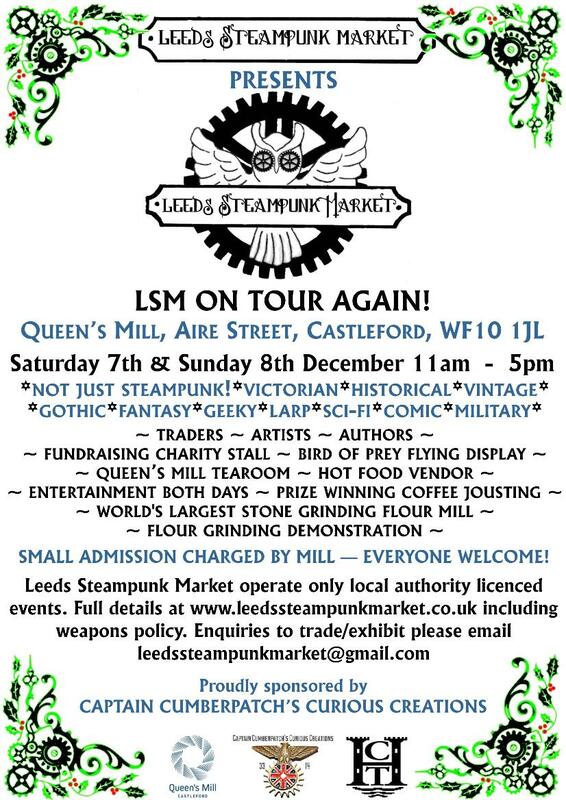 The LSM Christmas Steampunk Market has now moved from its previous location of Bradford Industrial Museum and will now be at the historic Queen's Mill, Aire Street, Castleford, WF10 1JL. The date has changed as well as they have their own Christmas fair on Saturday 30th November so we needed to move to the weekend of 7th & 8th December 2019. Queen's Mill, previously known locally as Allinson's Mill and before that Castleford Mill, is the world's largest stone grinding flour mill, with twenty pairs of stones. Although not a listed building, the mill is of significance because of its history, heritage and importance in the local community over hundreds of years. Although this is not a museum, there will be a small admission charge (of most likely only £2) on this weekend by the Mill to help support them. They will be doing a demonstration of flour milling here on both days, milled from locally grown wheat. The flour is on sale in 1.5kg and 500gm bags which can be bought in the Queen‘s Mill Tea Room. There is continued renovation going on within the building with a viewing area on the top floor affording amazing views across the River Aire and the new footbridge. The current work has already seen the installation of new windows and heating throughout making this probably the cosiest mill building we've ever traded in! Recruiting for the Coffee Jousting (that's right, we do things different at LSM!) commences an hour before the tournament takes place on the Saturday only. (Rules on coffee jousting are on a separate post/tab on the website). Captain Cumberpatch's Curious Creations will be donating medals for the prizewinners (gold, silver and 2 bronze) and one also for the Coffee Jousting Beanmaster (the host). There will be traders on two floors - ground and 2nd* floor which will not be all the same people on both days and the traders will be accessible to all. There will be an all day tombola on both days to raise money for a local charity or good cause (to be confirmed) which all the traders will be donating to. We will not have our own vintage tearoom at this venue as the Queen's Mill Tea Room is there for visitors to enjoy afternoon tea. However the mill staff and volunteers will be offering basic takeaway cuppas at very cheap prices for the traders (who obviously won't have the time for queuing up in the Tearoom) from near their reception area. We will have a hot food trader on site near the doors. We do not know yet if dogs are allowed on site. We open for trading at 11am on both days, all stalls open and trading up to 5pm. Trading applications welcomed from our usual collection of steampunk, Victorian, military, gothic, dark and spooky, faery, pagan, LARP, roleplaying, historical, heritage crafts, Sci-Fi, Harry Potter, Alice in Wonderland, geeky, nerdy, comics, gaming, vintage, modelling (railway and dollshouse), a bit of Boardwalk Empire/Game of Thrones thrown in, alternative (but NOT in a fetish/burlesque way) - we think you can see how different we like the stock to be. A small spattering of general festive traders will be included in the mix as well. We have been advised by local authority that no counterfeit/illegal/contraband or offensive goods are sold at the Market (offensive goods include knives and guns) and no market traders from the Wakefield district are allowed to stand at the event. General commodity items must not be sold (which we never have anyway). Bus Services from Leeds, Wakefield and the local area. If you have SatNav the postcode is WF10 1JL. In terms of car parking the space there isn't huge, so we are asking traders to park in a public car park to allow more room for visitors. There are three car parks very close to us - the all day parking one is for the local Wilkos store - this is only £2.50 for the day. Also please be aware there are no cash point machines on the site although there are some in the main town centre which is 5 minutes walk or so.